I’m putting finishing touches on a presentation I’ll be making at the Washington Museum Association conference this week about objects museums have that they rarely or never show to the public. One of the treasures I’ll be featuring is Amelia Earhart’s flight jacket. Not the one she was wearing on that last flight, of course, but one she clearly treasured. The jacket is in the collection of the Buffalo Bill Center of the West in Cody, Wyoming (formerly the Buffalo Bill Historical Center) and there are photographs from the 1920s and 1930s showing her wearing jackets that look just like this one. According to the museum, Earhart wore this jacket during a two week visit to a friend’s Wyoming ranch in 1934, when she an her husband were on a delayed honeymoon – and when they asked the friend to begin building a cabin for them on property they’d purchased in the Cowboy State. In 1937, as Earhart was preparing for what would become her final flight, she began sending personal possessions – including this coat – out to Wyoming to have for use in her cabin. But, as we know, Earhart and and her navigator, Frederick Noonan, vanished over the South Pacific on July 2, 1937. That cabin never got finished and the jacket ended up in storage at the museum. 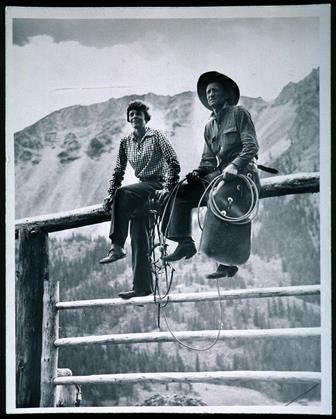 Amelia Earhart with with Carl Dunrud, who was building a cabin for Earhart and her husband in Wyoming. Courtesy Buffalo Bill Center of the West. Charles J. Belden, photographer, 1934.